With travelers becoming more connected, the travel industry has entered the unknown world of Social Media. Hotels, restaurants and tour companies have jumped on board by signing up for Twitter and Facebook. Cabo’s hotels are no different. A quick search on Twitter will give you more than a dozen hotels in Cabo. But, there is nothing worse than finding your hotel on Twitter and then seeing that they haven’t updated in a year. Yikes. The One&Only Palmilla, founded in the 1950s, is basically a Cabo icon. They constantly are ranked among the 500 best hotels in the world by Travel + Leisure. This Cabo hotel provides top notch service. You can have your dream vacation; whether you just want to lounge in your own infinity pool or have a full on luxury vacation with butlers who unpack and organize your clothes by color. They have popular restaurants such as Agua and Market as well as a spa and golf course. They update their fans on a regular basis. From specials to insider information, travelers can see what’s going on at the Palmilla. They are always sharing recipes, interviews and articles featuring reviews of the hotel. If you want to know what’s happening while you are in Cabo, the Palmilla’s Twitter is always up-to-date. They tweet photos: If you just want to take a virtual vacation to one of the best hotels in Cabo, you can just sit back and look at the gorgeous photos they tweet. They respond to travelers. @OOPalmilla isn’t all about themselves. If you have a question or concern, they’ll answer you. Or if you just want to tell them you enjoyed your vacation, they will acknowledge you. The Marquis Los Cabos is a relaxing Cabo hotel located near the One&Only Palmilla. This luxury hotel has plenty of suites and casitas that over look the Sea of Cortez. Complete with spa, Canto del Mar restaurant and elaborate swimming pool, the Marquis is a perfect Cabo retreat. They aren’t afraid of the negative. If a guest has a negative experience, the Marquis isn’t afraid to address it publicly. That’s the most powerful part of Social Media and the Marquis doesn’t try to hide from it. They participate in conversation with travelers. The Marquis’s twitter feed is full of conversations with other people, not just promotion of their hotel and services. They retweet other brands. The Marquis shares articles and specials that highlight companies other than themselves. Look for deals on activities and airlines. Pueblo Bonito, a Mexican chain of luxury hotels, has four resorts in Cabo. Two (Sunset Beach and Pacifica) are on the Pacific side and the other two are on Medano Beach (Los Cabos and Rose). The Pacifica has been ranked one of the best hotels in Latin America by Travel + Leisure. Pueblo Bonito’s has a pretty impressive following. Here’s how we think they got them. They post deals and specials: One of the things customers are always looking for when they follow a hotel on twitter is – what’s in it for me? 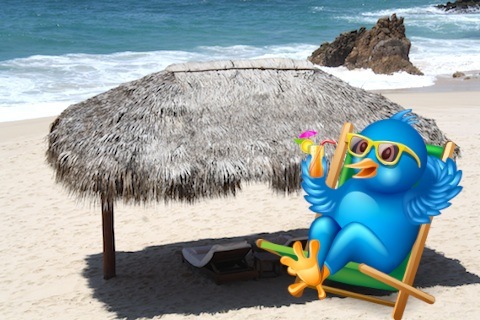 @PuebloBonito does a good job of updating followers when they can get 10% off or special activities deals. They share contests: Want to win a stay at Pueblo Bonito? Follow them on Twitter and they will keep you up-to-date on where you can enter. They have great photos. Pueblo Bonito’s staff takes some of the best photos around. They are totally eye candy. Capella Pedregal is a luxury resort located on the Pacific side of Cabo. You can only reach Capella Pedregal through a 300-meter long tunnel carved into the mountains (the only privately owned tunnel in Mexico). Additions like El Farrallon, a restaurant carved into the mountains, and a spa make this newer resort a contenter in the ranks of the best hotels in Cabo. And the views are pretty amazing! Capella Pedregal does a good job of keeping up with their Twitter. They tweet regularly: Like the One&Only Palmilla, the Capella Pedregal Twitter is updated almost daily. They integrate Facebook and Blogs: @CapellaPedregal can be counted on to share photos of their resort on their Facebook. From photos of special events like private dinners to photos of their Spa, travelers can check out the hotel before they visit. Capella Pedregal also has a hotel blog where they share recipes and more. And they make sure that their Twitter followers get their share of the information. They share events: Capella Pedregal keeps you updated on hotel events so you’ll know before your visit about goodies like their Easter Brunch. ME by Melia has three hotels – ME Cabo, ME Cancun and ME Barcelona. ME Cabo is located on Medano Beach and is home to the famous Nikki Beach. ME Cabo has a luxury party atmosphere. Expect world famous DJs and top notch service, making it one of the best hotels in Cabo for celebrities to visit. While I wish the majority of the ME’s tweets were not the same as their Facebook posts, they do go out of their way to answer traveler questions. They tweet about parties: You can find out about some of the hottest parties in Cabo. Passion Club and Nikki Beach are both located on site at ME Cabo. They do tweet at travelers: A great example of this is when a traveler tweeted a photo of a dress and asked whether or not it was ok for an event. The ME responded with a helpful post on the dress code. What’s your favorite hotel on Twitter?